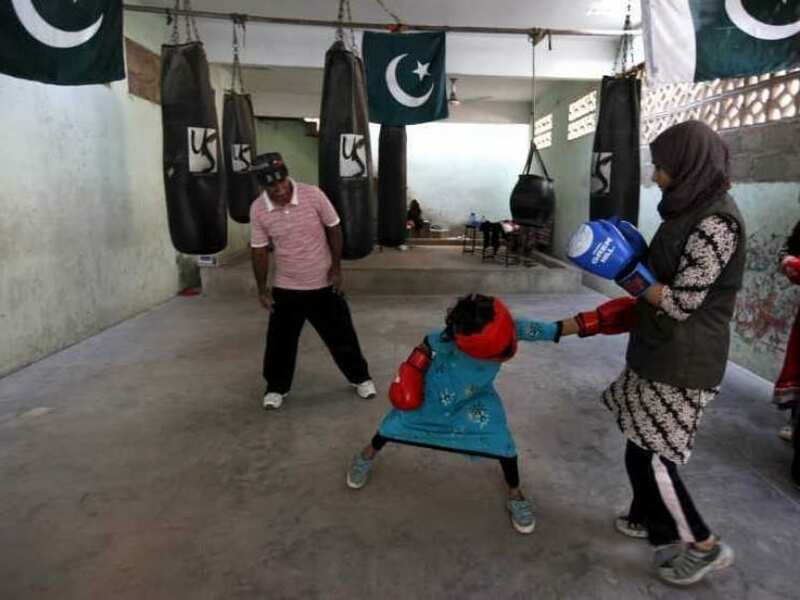 For the last six months, eight young Pakistani girls have been training at the Pak Shaheen Boxing Club in Lyari in the hope of one day bringing a medal home. 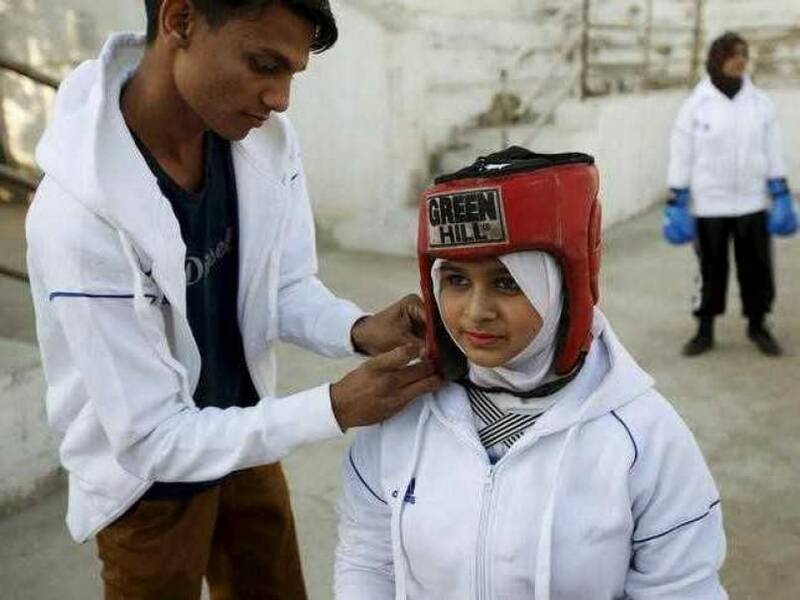 During the week, a dozen girls, aged eight to 17, go to the club after school to practise their jabs, hooks and upper cuts for hours in the hope of one day bringing a medal home to Pakistan. "I have been training since I was a child," said Urooj Qambrani, 15. "Inshallah, I will become an international boxer. I will make Pakistan's name famous." Two young girls fight during the Sindh Junior Sports Association Boxing Tournament in Karachi. 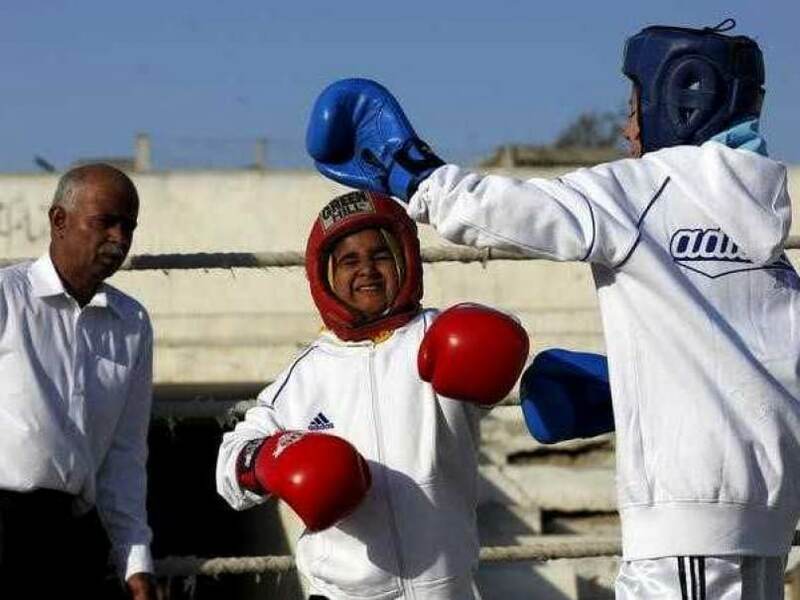 Pakistani women have been training as boxers in small numbers and competed in the South Asian Games last year, said Younis Qambrani, the coach who founded the club in 1992. The growth of the sport for both men and women in Pakistan has been dogged by a lack of equipment and adequate facilities, but the situation is slowly improving, he said. In Pakistan, women and girls face additional obstacles - both from Taliban threats for going to school and also violence from family members, including so-called "honour killings" in which male relatives kill girls deemed to have brought shame to the family name. In October, the Sindh Boxing Association organised a camp for female boxers in Karachi, the first time that a government-supported event for women in the sport was held in the country, according to media reports. Some of the girls in Qambrani's family, who had taken up practising at home, participated in the camp, and came to Qambrani afterwards to ask why they couldn't train at his club as well. Despite Taliban threat, some girls have begun to participate in tournaments, at home in the ring in white track suits, head scarves and boxing gloves. "A number of girls were keen on training, but due to social pressures, I had been avoiding the issue," Younis Qambrani said. "Last year a girl came to me, asking why girls couldn't train. I was moved when she said, 'No one teaches us how to defend ourselves,'" he said. Since then, some of the girls have begun to participate in tournaments, at home in the ring in white track suits, head scarves and boxing gloves. For Anum Qambrani, the coach's 17-year-old daughter, getting the chance to train formally in the club was nothing short of fulfilling her birthright. "My two uncles are international boxers, and my father is a coach," she said. "Boxing is in our blood."